Following on from its hugely successful release in Ireland and the UK, where it achieved on of the biggest box office for an Irish film in 2017 ($1 million), ‘Maze’ goes on theatrical release across the USA this week through distributor Lightyear Entertainment. 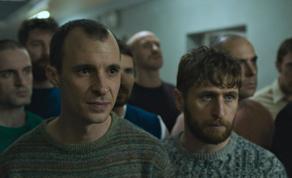 The Irish Voice describes the film as “Gripping” and praises Tom Vaughan-Lawlor as “Outstanding”, adding that he is matched by his co-star Barry Ward in “a screen acting prize fight … the dance between the two men is fascinating to watch.” The Irish Echo praises the film’s “authentic feel” and David Grennan’s “claustrophobic cinematography”. ‘Maze’ had its New York premiere at a sold-out screening at Scandinavia House, Manhattan on March 21st organised by Irish Screen America, which was attended by star Tom Vaughan-Lawlor, producer Jane Doolan, and writer/director Stephen Burke. This will be followed by screenings at the Sommerville Theatre in Boston and the film’s LA premiere on March 27th, again with Irish Screen America at Laemmle’s Film Center in Santa Monica, Los Angeles. The film is based on the true story of the 1983 mass breakout of 38 IRA prisoners from HMP Maze high-security prison in Northern Ireland. As Larry Marley (Tom Vaughan-Lawlor), the chief architect of the escape, schemes his way towards pulling off this feat, he comes into contact with prison warder, Gordon Close (Barry Ward). Initially, Larry and Gordon are confirmed enemies, born on opposite sides of Northern Ireland’s political divide, but when Larry realises that Gordon may be unwittingly useful for his escape plan, a slow seduction begins. Larry intends to use and manipulate Gordon in order to get closer to his goal but what follows is a tense and intriguing drama in which an unlikely relationship is forged between two enemies that will have far-reaching consequences for both of them. ‘Maze’ is a Mammoth Films and Cyprus Avenue Production, in co-production with Filmgate Films, Sweden and was financed by The Irish Film Board, RTE, BAI, Film Vast, Windmill Lane, Cork regional funding and Irish tax incentives for the film industry.